Arnold fountain pen from the 1950s. Lever filling 5-1/4" pen is black with thin red streaks. It has a firm steel medium nib. Very Nice condition, fully restored. Type Lever filler fountain pen. Product Name Unknown. 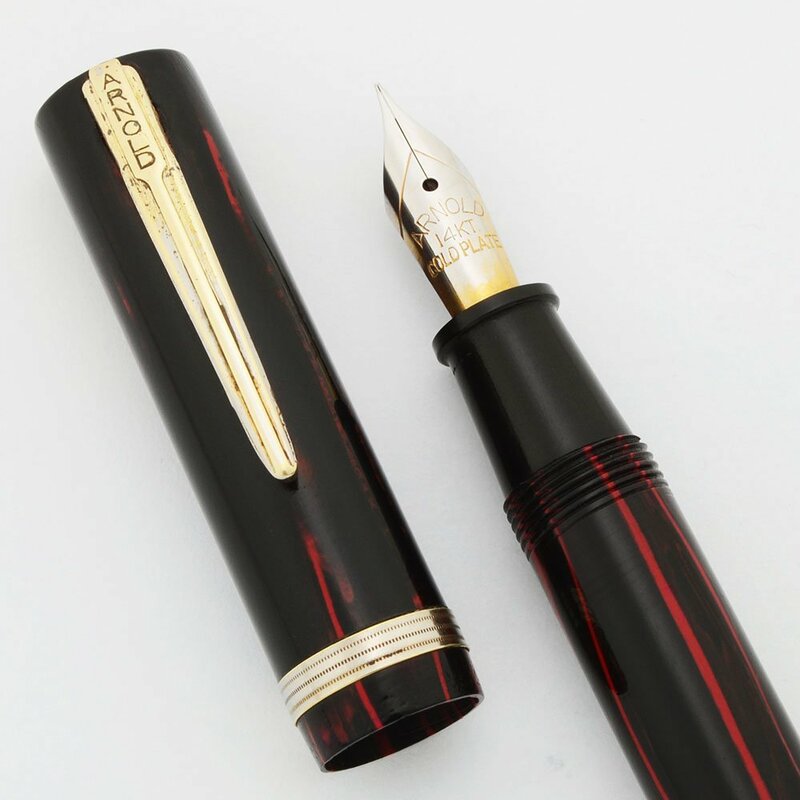 The nib is marked "ARNOLD 14k GOLDPLATED". Manufacturer and Year Arnold, made in USA -- Probably 1940s-50s. Filling System Lever filler. We've replaced the ink sac and tested the pen, and it works well. Color Black with thin red streaks and gold colored trim. Nib Medium gold-plated steel nib. Condition Very Nice condition. The trim shows some wear and brassing and the plastic is fairly smooth. Plating on the nib is worn away from the front end, but this does not affect the pen's performance. The pen looks very good with no warping. No scratches, chips, or dents. Fully restored and working well.